One of the biggest challenges I hear from customers, over and over again, is their lack of time. At Content Sparks, we tackle a big portion of that issue by providing ready-to-go courses and other marketing content. However, you still have the problem of using that content and setting it up as a course! The solution is simple. By hiring and training a virtual assistant, you can get your courses set up in a fraction of the time it takes to do it yourself. When you’re first starting out in your business, most people do everything themselves. I certainly did! I learned to build a blog, create some graphics, set up an ecommerce store, install plugins, add styling to documents, record and upload videos, put together a funnel, build an email list, set up an online course, etc., etc. But I quickly realized that I’d never be able to grow without getting help. The most critical hire I ever made was a virtual assistant (or VA, for short). My VA took on tasks that either I didn’t want to do or which were sucking time away from scaling my business. The result was that my business was suddenly able to take off, because I was finally focusing on what mattered most for growth. A virtual assistant will make the difference between having valuable content gathering dust on your computer and a priceless asset that’s building your reputation and revenue. But what exactly can your VA do when it comes to implementing the brandable, done-for-you content you get from us? If you don’t already have templates set up for all your content, a VA can do that for you. When it comes to courses, you’ll want templates for things like the documents you give to students, your slideshows, emails, graphics, and any handouts. If there’s outsourcing involved, such as to graphic designers, your VA can help manage those people. Your VA can apply all your branding to the content you purchase and to any content you create from scratch. For example, give your VA access to your branded templates, graphics, colors, fonts, styles, and anything else they need. Then, whenever you buy or create new content, have them add your logo, name, design standards, and any standard content (like bios and links). Once your VA knows your business well, they can edit wording to add language that you always use. They can also search for examples, quotes, statistics, and resources. And they can add links to other content, sales pages, and affiliate recommendations. A great time-saver is to have your VA search for and add related images to slideshows, documents, blog posts, and sales pages. If they have graphics skills, try having them create graphics for social media and other content marketing. You’ll always want your VA to do the work of converting documents to their ready-to-publish format. However, you can also ask them to save your recorded slideshow as a video. If they have video editing skills, they could even edit it for you and add your standard intro and outro. For all content, they should be able to upload it to your target platforms – like WordPress, YouTube, Slideshare, Facebook Group, etc. When it comes to getting your courses up and running, make sure your VA does the time-consuming parts for you. That includes setting up the outline structure of the course on your platform (we use Teachable), such as the basic module titles, lessons, course pages, graphics, etc. The idea is to have everything ready with placeholders for your course content. Once your content is ready, your VA can upload it to the relevant modules on your course platform and check that everything is working. If you have a difficult time with funnel set ups, make sure your VA is capable of setting up sales pages, opt-in pages, thank you pages, and email follow-ups. This is an area you may have to learn yourself and then teach to a VA. But once you have one funnel in place, it will be easy for them to replicate for future courses too. There’s a lot of content you’ll want to create for marketing your course and your business. A virtual assistant can help you with creating and/or formatting your lead magnets, social media content, slideshows, infographics, etc. They can also help with publishing and scheduling the content wherever you want for maximum visibility. Social media is a sensitive area, but your VA can help make it management in a few ways. Once you’ve trained them on your platforms and the way you like things, have them help with scheduling and posting content to your profiles, including publishing your blog posts to LinkedIn and Medium. As they become more familiar with your business and your customers, they can moderate group requests and comments. You could even have them set up Facebook Live video for you. Once your VA knows your business and your values well, they can pitch in with customer support. They can answer questions, deal with requests for refunds or coupons, help with tech problems accessing your content, share links to helpful resources, or even create short video tutorials. If running webinars is part of your business, your VA can help set up your webinars and moderate questions and comments during the webinar itself. They can download the recordings and upload them YouTube or elsewhere. And they can upload the webinar to your course platform when it’s ready. Last, but not least, your virtual assistant can save you time by doing basic research when you need additional information for your course or for other content you want to create. They can find good sources for you and even organize that information. If you do any surveys of students, you could ask your VA to download the data and do a first level analysis for you too. 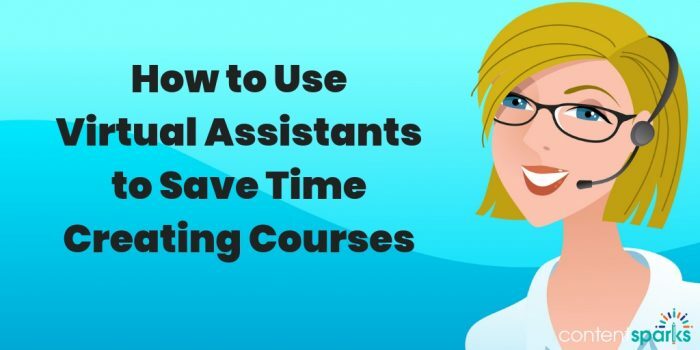 Those are a few of the main areas where a virtual assistant will save you time when creating courses, launching, marketing, and delivering them. However, a lot of what your VA can do will depend on their individual skills. Some might be able to do all of the above, but that’s rare. You have to pick and choose what’s important to you. What Skills and Qualities Does Your VA Need? The skills you need in your own VA depend on which aspects of your business you want to focus on, and which ones you want to outsource. Every time you make a to do list, think about which items you could delegate to someone else and which ones you should focus on yourself. Specific Software – Make sure your VA knows the main software you use. If it’s not Microsoft Office (which most of our content is in), then see if they know how to convert from Office to your programs. WordPress – If you have a WordPress website or blog, a VA can help with setting up and formatting your blog posts and other content. Course Platform or Membership Site – Ideally, your VA will already be very familiar with whatever course or membership site platform you use. Otherwise, be prepared to invest the time and money to train them. Editing – If you want your VA to be able to edit your own writing or content you buy from others, make sure they speak your native language. Then test them with a small assignment. Ability to follow instructions – One way to test this is to put a series of instructions in your VA job ad, including a hidden question (like “include the word ‘cookie’ in your job reply). Desire to learn and try new things – No VA will have all the skills you want or need now, but so long as they love to learn, you’ll be set for the future. Just make sure they can learn quickly since you won’t want to spend months training someone. The right attitude for your business – Be clear about the values that are important for you business and make sure your VA has the same ones. It’s difficult to train someone on values. But it’s easy if they have the same attitude as you do from the start. Don’t forget that you will also be in search of skills that are specific to your individual business. For example, if you do a lot of one-on-one coaching and want help with scheduling calls, then it’s helpful if your VA knows your scheduling system. Sure, you’ll still want to do a lot yourself at first, especially if you’re on a very tight budget and don’t have any steady income yet. But when you’re ready to make the investment of hiring a virtual assistant, you’ll never look back. And you’ll wonder how you ever survived without one! Want a handy checklist to help you hire the right Virtual Assistant? Use our Virtual Assistant Hiring Checklist to help you find the perfect person to free up your time and help you grow your business – especially when it comes to using our brandable, done-for-you courses. Want to learn more AND teach others how to hire a virtual assistant? 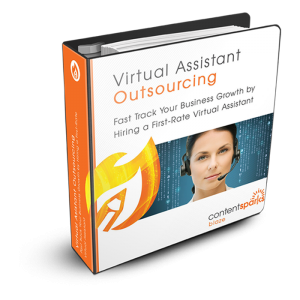 Check out our brandable, done-for-you course called Virtual Assistant Outsourcing. It’s all about how to hire your first VA to save time and fast track your business growth. You can quickly create your own online courses, self-study ebooks, video series, live workshops, eCourses, and more. We've done the hard work for you. All you have to do is customize it to your market and add your own language and additional insights.